So it was a few days before Halloween, and I was checking out Craigslist just to see what was there, and there was a headline that caught my eye. I had to check it out. Sure we didn’t need a dining room table, but how can you ignore a headline like that, especially three days before Halloween? 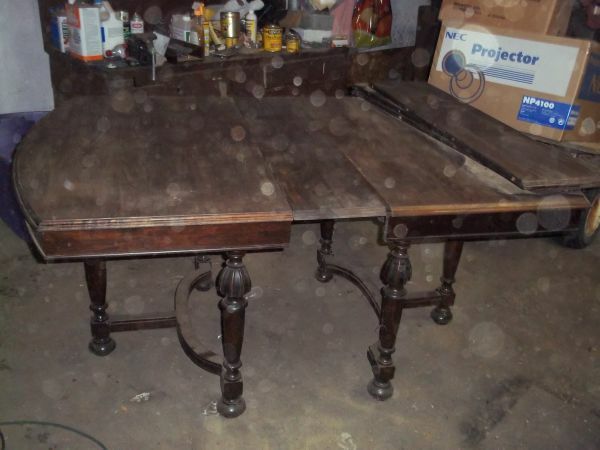 Let me tell you, I’m so glad I did, because the table is beautiful, or at least it will be once it’s refinished. So why did she think it was haunted? Because every time she took a picture of it orbs showed up in the picture. I don’t know if I believe in furniture being haunted, but I might get some holy water and sprinkle on it just in case! Do you think it’s possible it could be haunted? Jim and I both thought it was a good deal for $75. It has four leaves and it’s solid. The only concern we had was there were some screws in the legs that didn’t attach to anything. But once we got it home, we realized that the legs were on backwards. Once they were on the right way, all the screws had a place to go…although there are a few that are missing that will have to be replaced. Now, I’ll admit there is a part of me that wants to paint the legs and the apron, but we’re not going to do that. Instead, we’re going to ask my dad to strip it and restain it with mahogany stain. Yes, I know, I know. It would look so nice with the white legs, but we both love mahogany. 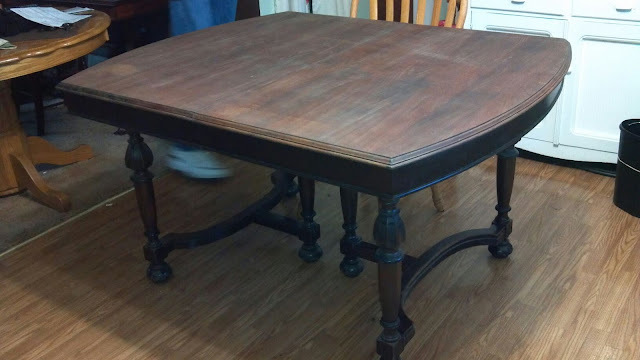 Plus, by not painting it, it will blend very nicely with the library table we bought a few years ago that my dad refinished for us. 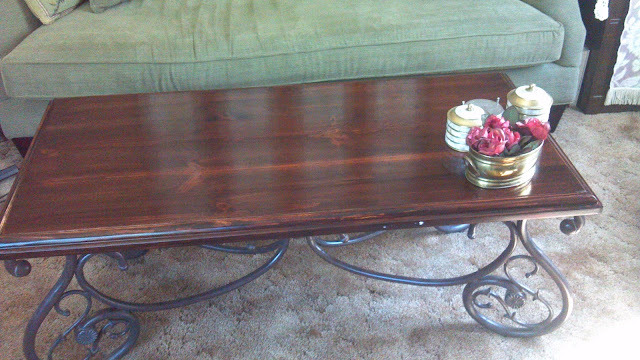 And then there’s the coffee table I finished this summer. See how everything is going to look nice together? But there is one problem… Mahogany is very formal, and our little house is not formal. We’re not formal. 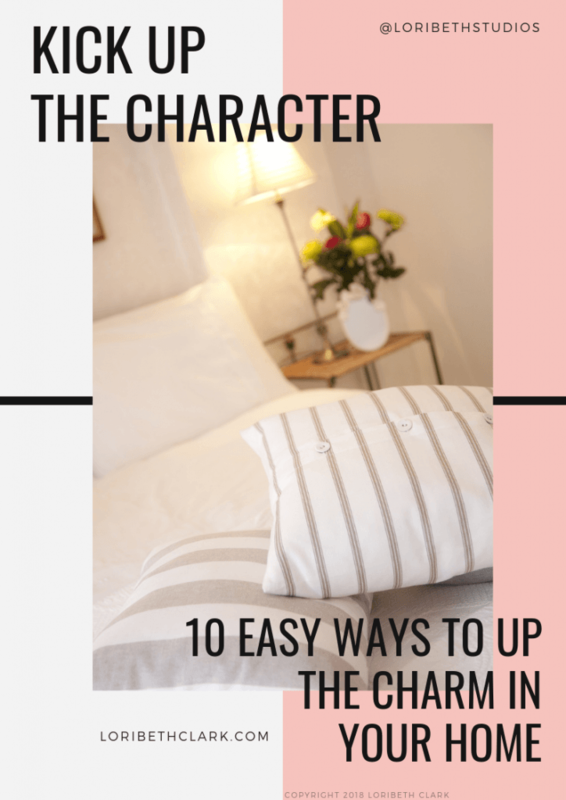 Although, I like to think home is kind of an elegant country casual…yes, my own term. Plus, I don’t want everything to be matchy-matchy. So what am I going to do? I actually have a plan. I’m hoping it will work out, because I haven’t found any inspiration pictures that look anything like I’m thinking. 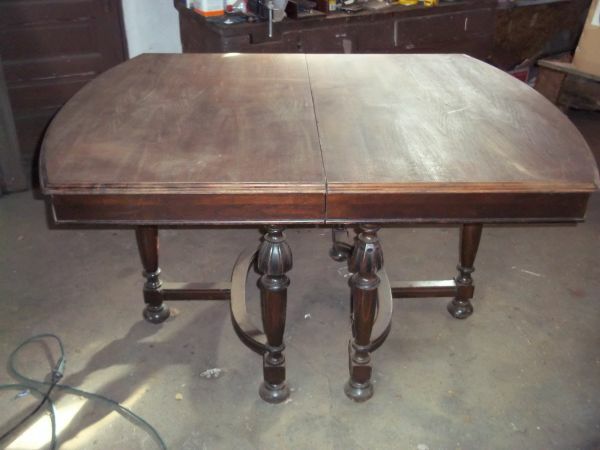 All the mismatched dining sets I’ve found have casual tables, and our table will be formal. I think that getting mahogany chairs–although it would look beautiful–would be too formal; plus, finding six matching chairs would be really hard. Like I said, it’s just not our style, but we have some chairs from Jim’s old dining room set. We’ve sold the table, but we still have the chairs. They’re heavy, and they’re totally the wrong kind of wood. 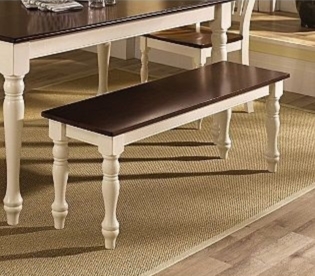 So this is what I’m thinking… What if I painted them white, and then got a bench like the one below? I found this bench on the Kmart website. 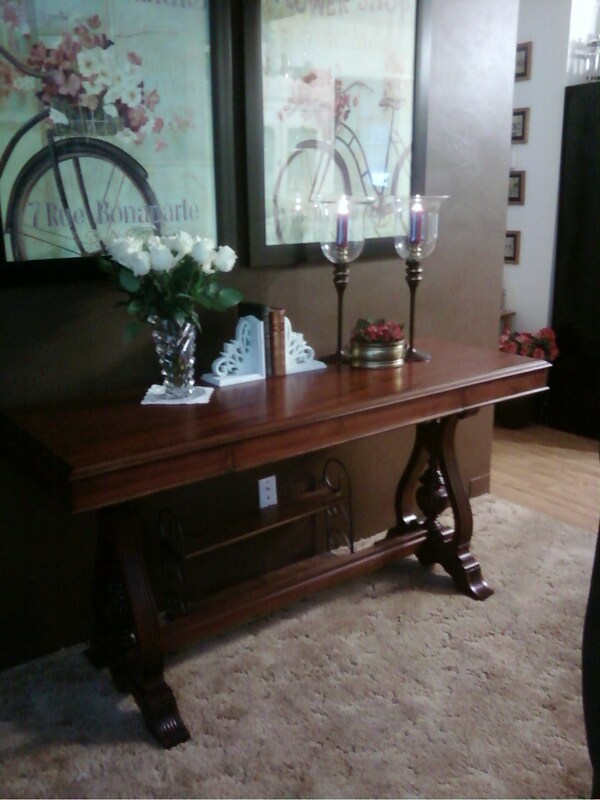 It shows the look I was thinking of to go with the table. 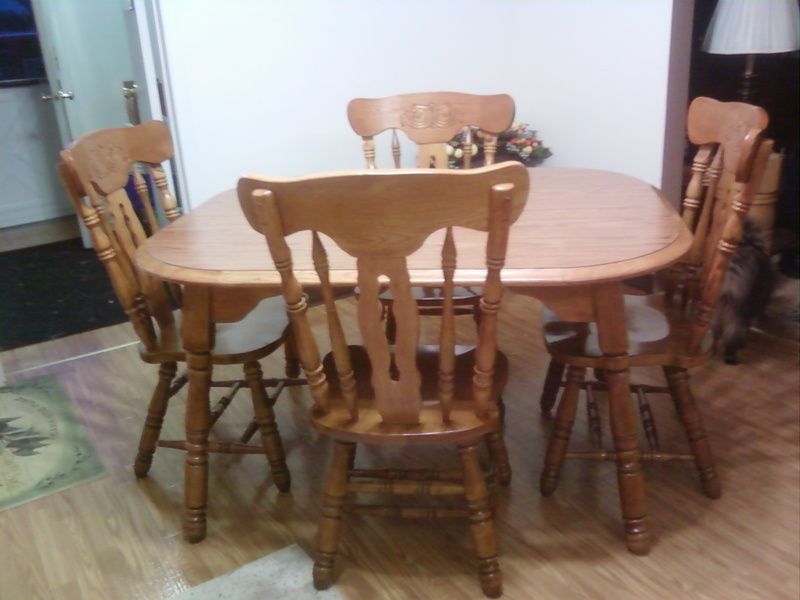 Between the antique table, the old chairs and the new bench, I think I could get the eclectic country look I want. The reason I’m thinking about getting a bench is because the dining area in our kitchen isn’t very large, and because we rarely have people over. 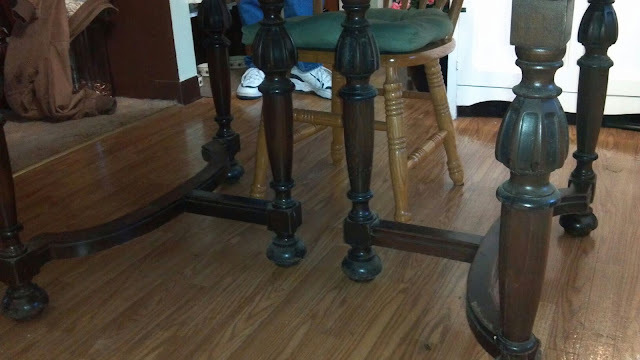 The bench could be pushed completely under the table, which would open up a little more room to get around the table. The more I think about this, the more excited I’m getting. I wish I could move it into the kitchen right now!! So what do you think of my Craigslist find and my ideas? Do you have any other ideas that might work for the table? Oh! I didn’t show you the picture with all the orbs! Here it is! Picture from the ad with orbs. We brought the table in tonight to take a look at how it would fit in the dining area. It’s a little larger than what I thought it would be, but I think it is actually going to give the room more of the cottage country look that we wanted. Our other table is just so new looking, and we do like the antique look of it. So, Jim has been busily replacing missing hardware, and I’ve been cleaning all the dust and grime off it. I can already tell it is liking its new home. You can see that its already feeling loved again. OH! and notice… No orbs on the pictures I took. I think it’s safe to say there are no spirits attached to this table. But then again, maybe they’re just so glad the table is being loved and going to be beautiful again that they’ve decided not to reveal themselves!